Our theme this month for #BundtBakers is Birthday Bundts. I am one of those unfortunate people who have a December birthday, and it always seems to be an afterthought, or just forgotten altogether. I really like the idea of celebrating in January instead. I can't wait to see what everyone has chosen as their Birthday Bundt. I am not really a big fan of cakes covered in a lot of frosting and sprinkles, so I tend to chose a plainer cake as my birthday cake. 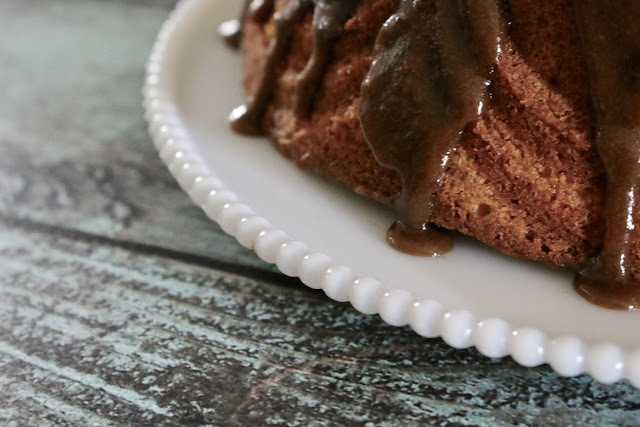 One of my favorites is banana cake, so I went looking for a recipe that had a simple glaze or frosting. The one I chose had a yummy-sounding vanilla caramel glaze. 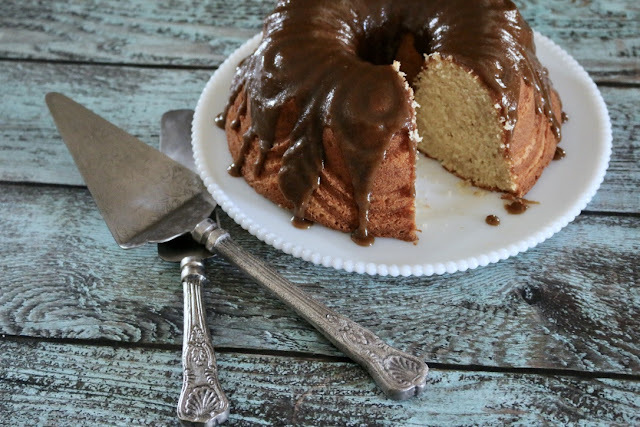 The original recipe was made in a mini bundt pan, and although I do have quite a few bundt pans, a mini bundt pan is not one of them. So I doubled the recipe and made it in a standard bundt pan. 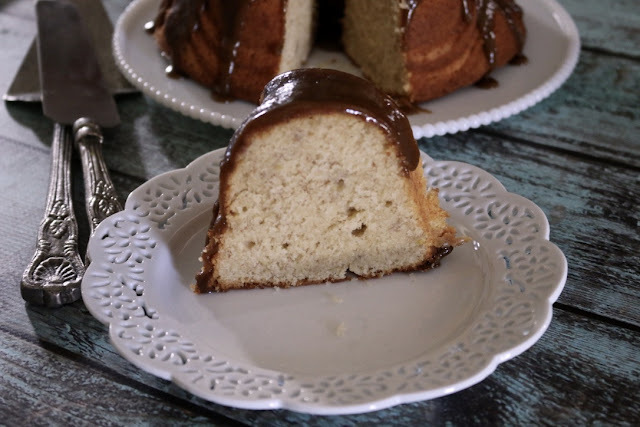 This bundt was quick and easy to put together, and is a great way to use up those extra bananas that are becoming overripe on your countertop. Unfortunately I was rushing and messed up the glaze a little bit. I did not take the time to completely melt the brown sugar mixture, so the texture turned out a little grainy. The caramel still had a great flavor, but I would definitely take more care next time so that it is a nice shiny glaze. 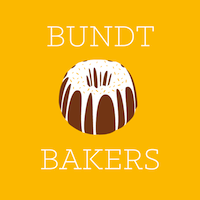 If you would like to know more about #BundtBakers and see what the other bakers made for our Birthday Bundts theme please scroll down below the recipe. Thank you to Sue from Palatable Pastime for hosting this month. In the bowl of a stand mixer cream together the butter, sugar, and salt until light and fluffy. In a small bowl mash banana well, add eggs and beat until combined. Add banana mixture to butter mixture, along with the vanilla and milk and beat well. In a medium bowl add the baking powder, cinnamon, and flour, and whisk to combine. Add flour mixture to the stand mixer bowl, and beat until the mixture is creamy in consistency. Bake for approximately 1 hour, or until a toothpick inserted into the center comes out clean. 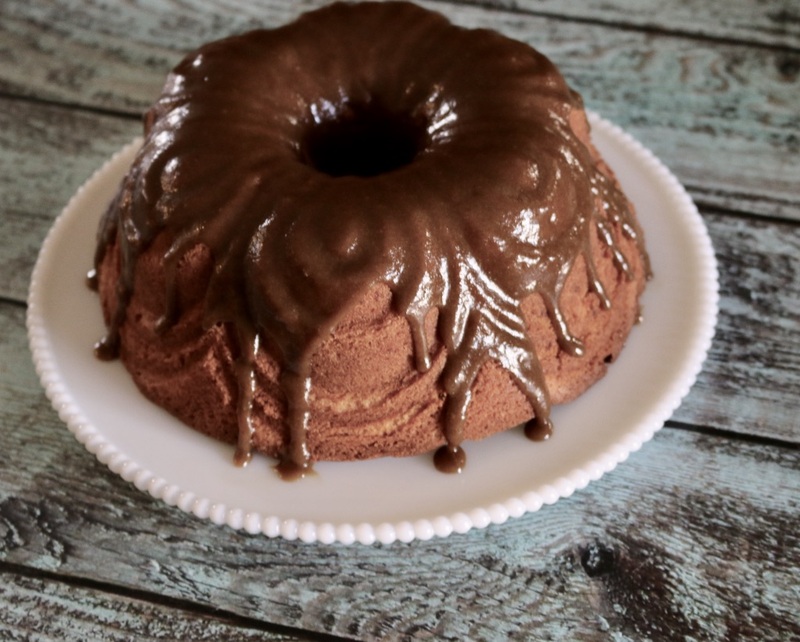 Cool in the pan for 10 minutes, then turn out onto a wire rack to cool slightly as you make the caramel. Add the ingredients to a small non-stick skillet over medium-high heat. Keep stirring, the sugar will melt quickly and the glaze will start to bubble up. Remove from the heat once it has thickened a little, but still seems a little thin to use as it will thicken as it cools. Allow it to cool a couple minutes before glazing the cake. It should be thick enough to slowly roll down sides of cake, but not stiff. For US measurements please click here. Happy belated Birthday Felice. 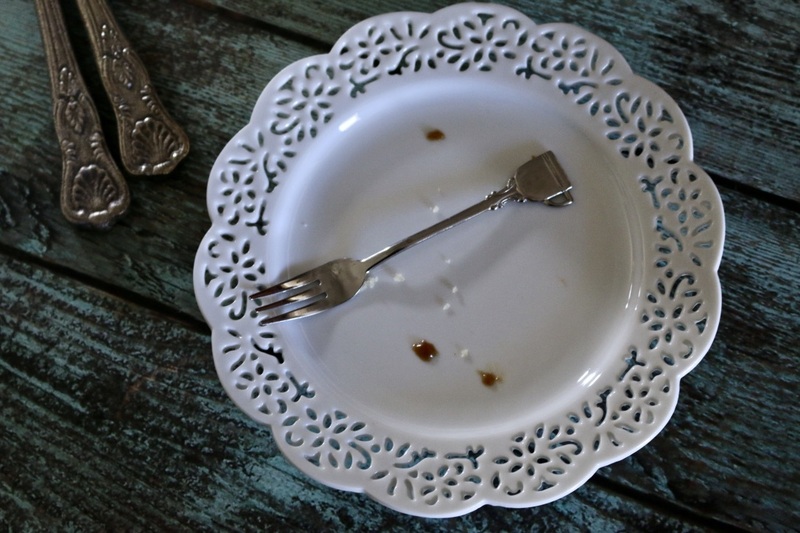 Your cake looks wonderful and I thought the glaze was perfect. I love the caramel glaze. Very delicious!!! The last picture is very fun I supouse that It must be incredible. I too am one of the forgotten...birthday cake in January isn't quite the same! A prefer as simple cake, too. Banana and caramel is a great combination. Happy belated/super early birthday!